A lossless player with balanced headphone amplifier output.DSD Using dual SABRE9018Q2C which from USA ESS technology,feature high SNR,very low THD+N and build-in large current headphone amplifier. Support bluetooth 4.0 input and APT-X lossness.Support bluetooth transmission,can use to connect bluetooth headset.Support Hiby APP to control this product(Hiby Link). Support"ISO、APE、FLAC、WAV、ALAC、WMA、AIFF、MP3、DFF、DSD" and many other music files.The sampling rate of these file are up to 32bit / 384K（PCM）and DSD256. 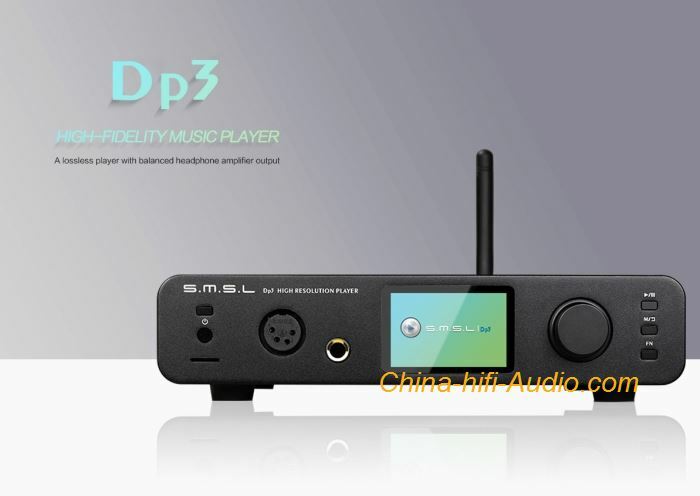 The Micro-USB port can connect to computer make DP3 a USB DAC.DP3 can act as a USB host to connect a external USB DAC and also support DSD streaming. Support network playback（DLNA＆AirPlay）via Ethernet and WiFi (2.4G and 5G).Built-in headphone amplifier,both unbalanced and balanced.All path digital output,coaxial,optical,AES/EBU,even USB. Supporting wireless control on smartphones for a more convenient and easier experience. LAN network connection can be done both by Wi-Fi or cable.It is corresponding with multiple network application scenarios. High specification playback performance, supporting multiple audio formats. Notes: 1. When using airplay, the buffer of airplay is quite small, so it is often influenced by the wifi environment. Therefore, a good wifi environment is necessary.